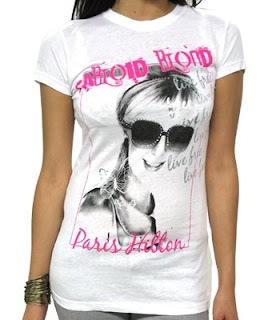 Who would have want to wear Paris Hilton's design? When the hotel heiress launched her clothing line everyone was kind of thinking who the hell is going to buy it? But infairness to the Hilton Princess she design quite good and to her avid fans it is something they could collect for. Honestly, I would wear some of it as long as I like the design and the style. She is at least making her own brand name and that is something you would call a success. To Americans fans of Paris or even her global fans would prefer to spend the asking price of Paris Fashion clothing, in fairness they are all quite in reasonable price. I will pick my favourite of all the Tee (picture shown below) and I would not mind wearing them on casual day but not in hundreds years I would wear the shorts pants or shall I say hot pants? Is it? I hate shiny material and never own a piece of such clothing. 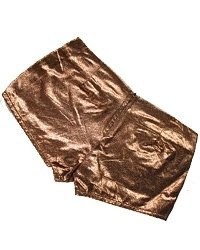 I am a big fan of hot pants of any colour but rather not shiny. No way! Anyway, for her fans information, both Tee and hot pants are only $68 bucks. Go and grab 'em now!